A stunning glass staircase, designed, manufactured and installed by Arkoni, is now taking pride of place in a brand new, luxury, high specification development on Merseyside. Burbo Point overlooking the beautiful Blundell Sands is a collection of two and three bedroom residences that is being marketed as the North West’s ultimate beach front development. 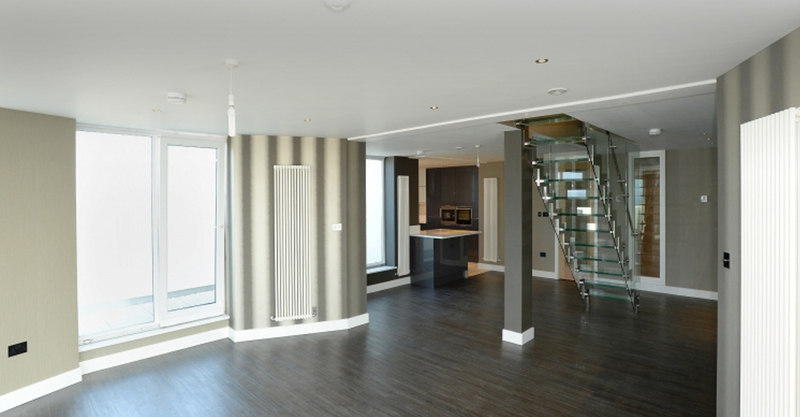 The staircase is included within the Penthouse apartment at Burbo Point and has been manufactured from stainless steel and glass and incorporates a glazed balustrade system. Each of the stair treads were constructed from toughened and laminated, 22.5mm thick glass with twin sandblasted nosings. The glazed balustrade infill panels were made from toughened 12mm thick PAR. According to Arkoni MD and founder Mark Prentice, the staircase demonstrates the company’s ability to create bespoke, architectural features that add to the aesthetic appeal of residential developments. “This is a great example of how we can work closely with contractors, in this case Surrey-based WF Contracting, to design, manufacture and install very specific features that provide a real focus of attention. “Whilst it wasn’t a major project financially, coming in at £17,000, it did provide a number of challenges that were overcome by adopting a flexible approach. “It involved careful consideration, within the context of the overall design of the apartment, of how to strike a balance between the correct structural integrity and its final appearance within the penthouse,” added Mark.